Known for: accused in the 1692 Salem witch trials; she escaped conviction though two of her sisters were executed. Sarah Towne Cloyce's father was William Towne and her mother Joanna (Jone or Joan) Blessing Towne (~1595 - June 22, 1675), accused once of witchcraft herself. William and Joanna arrived in America around 1640. Among Sarah's siblings were two also caught up in the Salem witch hysteria of 1692: Rebecca Nurse (arrested March 24 and hanged June 19) and Mary Easty (arrested April 21, hanged September 22). Sarah married Edmund Bridges Jr. in England, about 1660. She was a widow with five children when she married Peter Cloyce, father of six; they had three children together. Sarah and Peter Cloyce lived in Salem Village and were members of Salem Village church. Sarah's sister, Rebecca Nurse, 71, was accused of witchcraft by Abigail Williams on March 19, 1692. She was visited by a local delegation on March 21 and arrested the next day. Magistrates John Hathorne and Jonathan Corwin examined Rebecca Nurse on March 24. March 27: Easter Sunday, which was not a special Sunday in the Puritan churches, saw Rev. Samuel Parris preaching on "dreadful witchcraft broke out here." He emphasized that the devil could not take the form of anyone innocent. Tituba, Sarah Osborne, Sarah Good, Rebecca Nurse and Martha Corey were in prison. During the sermon, Sarah Cloyce, likely thinking of her sister Rebecca Nurse, left the meetinghouse and slammed the door. On April 3, Sarah Cloyce defended her sister Rebecca against charges of witchcraft -- and found herself accused the next day. On April 8, Sarah Cloyce and Elizabeth Proctor were named in warrants and arrested. On April 10, the Sunday meeting at Salem Village was interrupted with incidents identified as caused by the specter of Sarah Cloyce. On April 11, Sarah Cloyce and Elizabeth Proctor were examined by magistrates John Hathorne and Jonathan Corwin. Also present were Deputy Governor Thomas Danforth, Isaac Addington (secretary of Massachusetts), Major Samuel Appleton, James Russell, and Samuel Sewall, as was the Rev. Nicholas Noyes, who gave the prayer. Rev. Samuel Parris took notes. 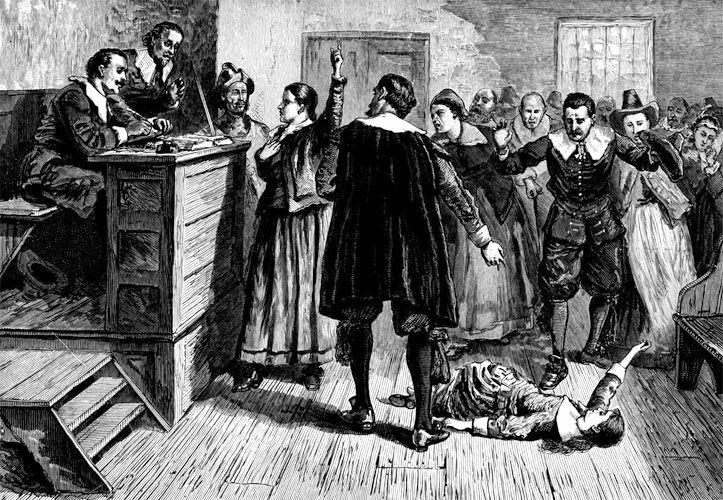 Sarah Cloyce was accused in testimony by John Indian, Mary Walcott, Abigail Williams, and Benjamin Gould. She shouted out that John Indian was a "grievous liar" and refused to confess. Among those who accused Sarah Cloyce was Mercy Lewis, whose paternal aunt Susanna Cloyce was Sarah's sister-in-law. Mercy Lewis took a less active role in accusing Sarah Cloyce than she did in accusing others including Sarah's sister Rebecca Nurse. That very night of April 11, Sarah Cloyce was transferred to Boston prison, along with her sister Rebecca Nurse, Martha Corey, Dorcas Good, and John and Elizabeth Proctor. Even after her jailing, John Indian, Mary Walcott, and Abigail Williams claimed to be tormented by Sarah Cloyce. Sarah's sister Mary Easty was arrested on April 21 and examined the next day. She was briefly set free in May but returned when the afflicted girls claimed to have seen her specter. A grand jury indicted Sarah's sister Rebecca Nurse in early June; on June 30 the trial jury found her not guilty. The accusers and spectators protested loudly when that decision was announced. The court asked them to reconsider the verdict, and the trial jury did so, then finding her guilty, discovering on reviewing the evidence that she had failed to answer one question put to her (perhaps because she was nearly deaf). Rebecca Nurse, too, was condemned to hang. Gov. Phips issued a reprieve but this was also met with protests and was rescinded. Rebecca Nurse was hanged, with Sarah Good, Elizabeth Howe, Susannah Martin and Sarah Wildes, on July 19. Mary Easty's case was heard in September, and she was found guilty on September 9. Together, the surviving sisters Sarah Cloyce and Mary Easty petitioned the court for a "fayre and equall hearing" of evidence for them as well as against them. They argued that they had no opportunity to defend themselves and were not allowed any counsel and that spectral evidence was not dependable. Mary Easty also added a second petition with a plea was focused more on others than herself: "I petition your honors not for my own life, for I know I must die, and my appointed time is set .... if it be possible, that no more blood be shed." But Mary's plea was not in time; she was hanged with Martha Corey (whose husband Giles Corey had been pressed to death on September 19), Alice Parker, Mary Parker, Ann Pudeator, Wilmott Redd, Margaret Scott and Samuel Wardwell on September 22. Rev. Nicholas Noyes officiated at this last execution in the Salem witch trials, saying after the execution, "What a sad thing it is to see eight firebrands of hell hanging there." In December, a brother of Sarah Cloyce helped pay the bond to release William Hobbs from jail. Charges against Sarah Cloyce were dismissed by a grand jury on January 3, 1693. Despite the charges being dropped, as was the custom, her husband Peter had to pay the prison for her fees before she could be released from imprisonment. Sarah and Peter Cloyce moved after her release, first to Marlborough and then to Sudbury, both in Massachusetts. "And particularly, as I was a chief instrument of accusing of Goodwife Nurse and her two sisters [including Sarah Cloyce], I desire to lie in the dust, and to be humbled for it, in that I was a cause, with others, of so sad a calamity to them and their families...."
In 1711, an act of the legislature reversed the attainders on many who had been convicted, but since Sarah Cloyce's case was eventually dismissed, she was not included in that act. Sarah Cloyce was the key character in the 1985 American Playhouse dramatization of her story in "Three Sovereigns for Sarah," starring Vanessa Redgrave as Sarah Cloyce in 1702, seeking justice for herself and her sisters. The television series based on Salem did not include Sarah Cloyce as a character.